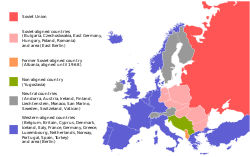 The political situation in Europe during the Cold War. Distinguish from the Warsaw Convention, which is an agreement about financial liability in air travel, and the Treaty of Warsaw (1970) between West Germany and the People's Republic of Poland. The Warsaw Pact was an organization of Central and Eastern European Communist states. The states were all allies and would fight together if one of them was attacked. While in theory all the countries in the organisation were equals, the smaller countries were controlled by the Soviet Union. It was established in 1955 in Warsaw, Poland in response to West Germany joining the North Atlantic Treaty Organization(NATO). The treaty was signed in Warsaw, on 14 May 1955 and official copies were made in the languages of Russian, Polish, Czech and German. The Pact lasted until the end of the Cold War when some members quit in 1991, following the collapse of the Eastern bloc and political changes in the Soviet Union. All the Communist states of Central and Eastern Europe signed except Yugoslavia. This page was last changed on 28 February 2019, at 20:32.